Burnin' down the house... which guitar would you rescue? 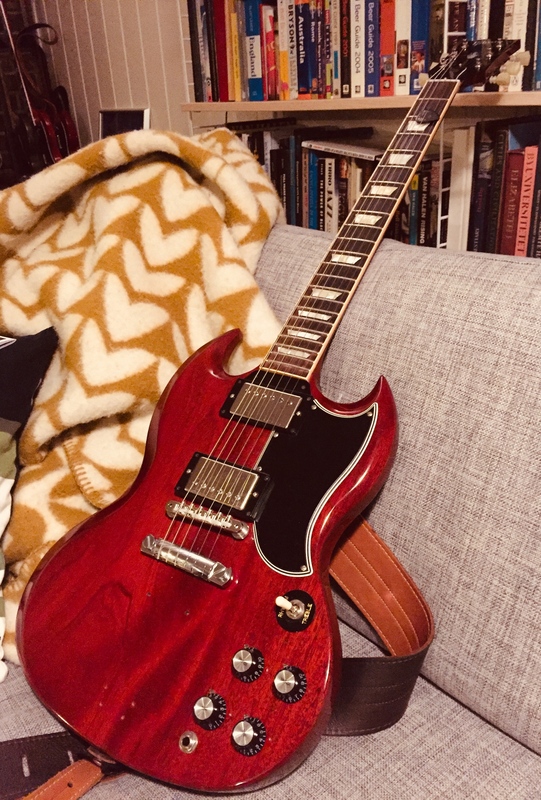 Discussion in 'Gibson SG' started by Col Mustard, Mar 18, 2019. What if the house was on fire? garage, which guitar would you grab? find it and link it here. That's okay. Steve D, arcticsg and Layne Matz like this. I gotta say this one! Steve D, Layne Matz, nico1975 and 3 others like this. Guitar? They can burn up - I have insurance for all that. I have plenty of personal papers and photos that are not replaceable. They get saved. Col Mustard, Thumpalumpacus and Layne Matz like this. Dallaz, Col Mustard, Steve D and 4 others like this. arcticsg, koaguilds and SG standard like this. arcticsg, Thumpalumpacus, GrumpyOldDBA and 1 other person like this. In truth I'd probably try to spend too long trying to decide and end up toast myself. The Guild because I've owned it for over 40 years, (but if it were lost, I'd probably not try to replace it wth another one), or the Yamaha, because I think it might just have the highest 'must have/hard to replace' ratio of any of my guitars. Col Mustard, arcticsg, koaguilds and 1 other person like this. Blucifer, Dallaz, papagayo and 6 others like this. This one of a kind limited run Epi Ultra 1, limited run for Australia. I've never seen another one like it. And since they hang next to each other in the studio, my Vintage G400. Col Mustard, Layne Matz, arcticsg and 1 other person like this. Like everyone else. People and pets safe. Then it’d be my Ovation. Col Mustard, arcticsg and Layne Matz like this. Man, I don't have any really nice guitars to worry about. An late 70s japanese Epiphone acoustic that I learned on and a 1991 "midnight blue" American standard strat (midnight blue apparently being a synonym for purple). And as of Friday in theory a 2018 SG Special. So today I'd save the strat, in a week my decision might be different! Col Mustard, cerebral gasket and arcticsg like this. Col Mustard and arcticsg like this. Col Mustard and Dale like this. Luckily I live in a garage with two windows and three doors, every guitar gets saved+ the vinyl. If I had to choose one it would probably be my Cort guitar due to its versitality and high monetary value- locking tuners, Seymour Duncans(JB Trembucker in the bridge), heavy block wilkinson trem, roller nut, great finish, and ergonomic psychedelic shape. I love my SG, and I can get another but this Cort is one of too few. As someone who gigs with 3-4 guitars minimum plus an Epi SG bass, I cant imagine what I would actually grab becuase i really utilize and enjoy all of them but the Cort would be the most logical/rational option. Who knows, if we get some more TORNADOES around here this year I might not be so lucky this time. Side note, I long ago decided that only my personal listening crate of records might survive a big disaster because there is no way on Earth we can move 2,000+ records anywhere quick enough. Also have the 10 dogs to get to safety. I've only got two guitars, so the Ibanez is coming-with and the Squier will be sacrificed to Jimi's ghost. In the other hand, my legal-files folder (med records, DD-214, thumb-drives with all backups etc are already packed) and my Tweaker 15 head ... three cheers for lunchbox amps! cerebral gasket, Col Mustard and Layne Matz like this. They'd ALL go in the RED truck of course! Col Mustard, Thumpalumpacus, cerebral gasket and 1 other person like this. Well what about you Col', which one are you grabbing first? BTW, lovely shot of the family you have there! Col Mustard, Thumpalumpacus, Dallaz and 3 others like this. I love the idea of the three P90 SG, how does it sound? Can you select each pickup individually? Pretty much. Three volumes one tone. The middle pickups volume is located where the neck pup tone use to be. The switch works the same as usual, neck/both/bridge and middle pup is always on, unless you kill the volume. It's really quite versatile. You can set the middle pup volume wherever you want, or turn it all the way down and use the switch, bridge/neck pups in standard config. Or you can use any combination of the three. You can even get it to where only the middle pickup is on. Lots of P90 goodness... cool stuff. Thumpalumpacus and Layne Matz like this.